Enjoy backcountry fishing at its finest in the channels and on the flats of the expansive waters that surround Key West. We use extremely light, light, and medium tackle (6#, 10#, 12#, 15#, 20#, and 25# test line) to catch a variety of species. 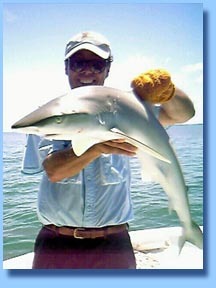 We can fish for snapper, jacks, barracuda, shark, tarpon, permit, bonefish, grouper or even mackerel. I have sat in one spot, on anchor, and caught 17 different species of fish in 4 hours. That's good action! We use live bait, chum and cut bait depending on what we're fishing for. We may drift a live pinfish or crab down a channel for tarpon; throw a shrimp-tipped jig for snapper, jacks or even bonefish; or put a cut bait out on wire for a barracuda or shark. We have caught many types of shark in these waters, from the 12ft hammerhead on 25# test that took 1hr 25min to land, to the smaller (2 to 4 ft) bonnethead sharks that you can sight cast a shrimp tipped jig to up on the flats. Probably the most exciting species of shark to catch is the spinner shark. When you hook one of these spinners they almost immediately come flying out of the water spinning around their long axis so rapidly that it's impossible to count the number of revolutions, throwing water in every direction like fireworks. I have seen them travel 30 feet through the air and I believe that they rival tarpon in the amount of adrenaline pumping excitement you can get from this acrobatic sport species. New in Our Recent Catches Gallery: Video Clips of Sawfish and Hammerhead Shark Catches!! In my recent catches gallery you can see me and the angler, Todd Pearce of Conway, S.C., holding up a trophy spinner shark (just under 6ft and almost 100lbs) that took us a good hour to get in while Todd's beautiful bride, Marla, fought a comparably sized lemon shark off the stern. As both anglers brought their fish closer to the boat, with Todd on the bow and Marla on the stern, there was a considerable period during which those sharks had that little flats boat spinning like a merry-go-round. Todd, Marla, and their son Eric have all put trophy fish on the wall while fishing with Capt. Dan's Fishing Charters. We use Grey Taxidermy because they do a good job, they are the world's largest marine taxidermist, and they guarantee their work for life. So, whether you want to delicately cast a crab to tailing permit on the flats or put a cut bait out for a giant toothisaurus maximus, there is plenty of rod-bending action to be had in the exquisite backcountry channels and flats of Key West. 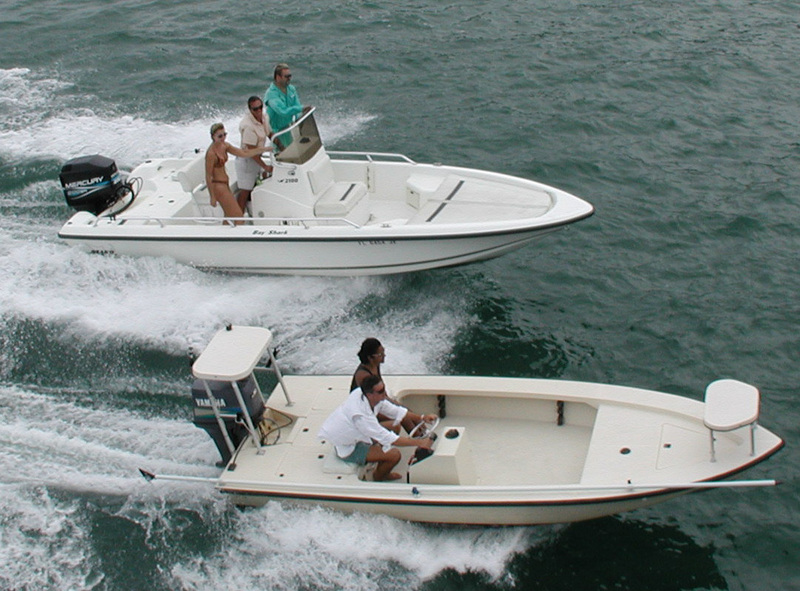 Backcountry Charters leave from the Galleon Marina located at 619 Front Street in the Historic Key West Seaport. A typical fight may last well over an hour with you and the fish competing for control. Complete tackle, bait and fishing expertise are provided. is a U.S.C.G. licensed captain since 1995.